Pharmaceutically active substances are a class of new, so-called "emerging" contaminants that have raised great concern in recent years. Human and veterinary drugs are constantly being introduced into the environment, mainly as a result of the manufacturing process. Over time, this level of chemical input may lead to long-term concentrations and promote continual, but unnoticed adverse effects on aquatic and terrestrial organisms. 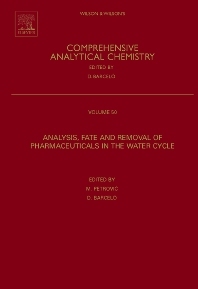 Analysis, Fate and Removal of Pharmaceuticals in the Water Cycle discusses state-of-the-art analytical methods for trace determination of pharmaceuticals in environmental samples while reviewing the fate and occurrence of pharmaceuticals in the water cycle (elimination in wastewater and drinking water treatment). Focus is given to the newest developments in the treatment technologies, such as membrane bioreactors and advance oxidation processes. Focuses on new treatment technologies, such as membrane bioreactors and advance oxidation processes.